Kentucky bluegrass (Poa pratensis) and St. Augustine grass (Stenotaphrum secundatum) have little in common other than being green and widely used for lawns. Their cultural requirements, uses and appearance couldn't be more divergent. Kentucky bluegrass is a cool-season grass that grows best when soil temperatures are around 60 degrees F. It cannot survive in the heat of the South. It over-winters well, even in even the harsh winters of Canada. On the other hand, St. Augustine thrives on heat, and with the exception of one carefully developed cultivar, cannot survive the winters north of South Carolina. 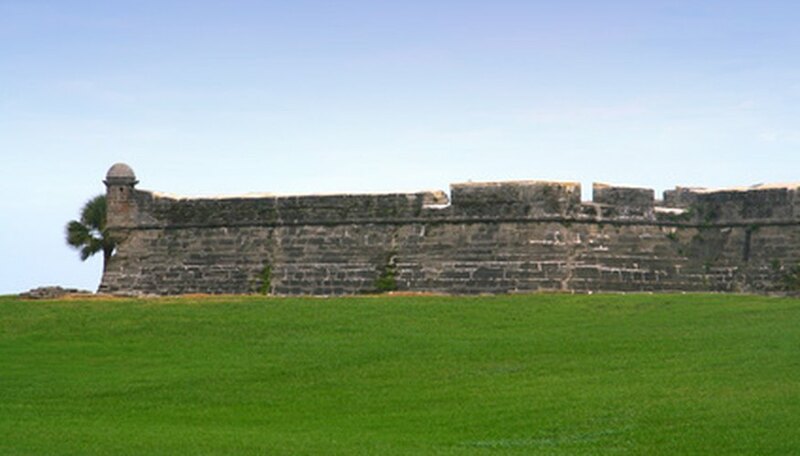 St. Augustine has a coarse, wide blade width, dense turf development and dark green color. Kentucky bluegrass has a medium to fine blade width (dependent on cultivar), with a dark green color and dense development. Kentucky bluegrass recovers from traffic well, which explains why it is widely used for sports fields in the Northeast and Upper Midwest, notes Penn State University. St. Augustine does not handle traffic well at all. St. Augustine is favored by southern homeowners who value appearance more than wear tolerance (Bermudagrass is the sports turf of the South). St. Augustine should be kept relatively long--2 1/2 to 3 1/2 inches, whereas Kentucky bluegrass should be kept from 3/4 to 2 1/2 inches. In both cases, no more than one-third of the blade length should be cut in any one mowing. Where rain is infrequent, St. Augustine needs careful irrigation to survive. Kentucky bluegrass survives long periods of drought by going dormant in the summer. It greens up quickly in response to either rainfall or irrigation, notes Texas A&M University. Kentucky bluegrass needs 2 to 6 lbs. of nitrogen per year over three applications, with the higher rate needed by newly planted lawns. Applications should be timed for late spring, once the normal spring growth spurt has slowed, and then in September and October. St. Augustine needs a monthly application of 1 lb. per 1,000 square feet during the growing season, which is normally March through September.